The biennial UITP Congress and Exhibition was held in Milan from 8 to 10 June. Bus manufacturers and their suppliers occupied a large oblong lower hall. The rail industry was in a larger upper hall, making me think that Roger Davies might have some comments about overheads on top of the bus industry! Curiously, several major companies that promote electronic ticketing systems were in the rail hall, even though bus passengers make many more transactions annually. UITP exhibitions are always about the quality of visitors, rather than quantity. Top professionals from the operating industry, politicians and legislators attend from all over the world. They are the people who have to think about the shape of urban transport a decade or more ahead. That ties in with UITP’s PTx2 programme to double the use of public transport in urban areas by 2025. UITP members include operators of metro and tram systems, but even so, there must be a substantial increase in demand for city buses. Part of this will be driven by anticipated growth in urban populations and part by the need to accelerate the replacement of older and more polluting buses. 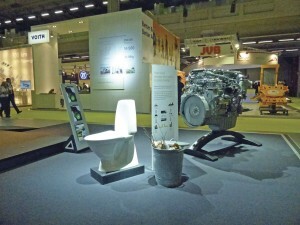 The exhibition was notable for offering a mixture of Euro6 diesel, hybrid, CNG and full electric models. Unusually, the bus exhibits were, with one exception, laid out on stands, side by side, along one of the long side walls, facing onto a broad central aisle. That enables this report to be completely impartial, moving in sequence from stand to stand. 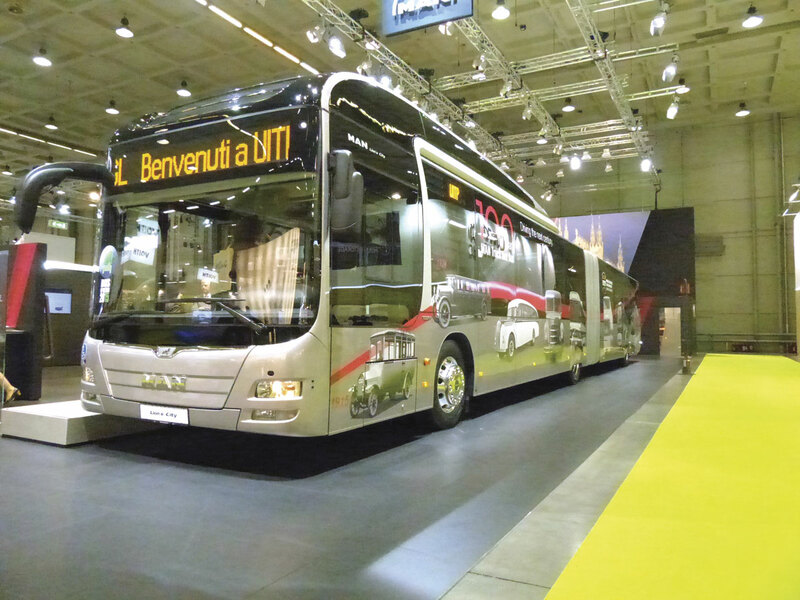 Starting at one end, MCV exhibited a low entry interurban bus on an MAN chassis, designed for the FAST Group in France, which has stopped building its own vehicles in the former Carrier factory in Alençon. FAST still has an extensive business running school and interurban services, mainly in the west of France. Next door, Mercedes-Benz showed the new CapaCity L, built to an overall length of 21m and designed to carry nearly as many passengers as a double articulated bus, without the technical complications of the latter. It uses a very high percentage of standard Citaro parts, with a second steering axle in the trailer section, giving it a gross weight of 32 tonnes and the ability to carry up to 191 passengers. Mercedes-Benz has more experience of Euro6 vehicles in service than any other manufacturer. The company maintains that emissions are extremely low and fuel economy is better than in previous generation engines. Mercedes-Benz launched the brand new M 936 G engine for operators who prefer CNG. Production is planned to start in the autumn of 2015. A notable feature of this 7.7-litre engine is that it delivers the same performance as a diesel engine while setting higher standards with respect to noise and exhaust emissions. It delivers maximum power of 302hp at 2,000rpm and maximum torque of 1200Nm at 1200-1600rpm. Although Mercedes-Benz is developing a new city bus platform that will be capable of taking diesel, gas and fuel cell power systems, the sales drive for the next three to four years will be firmly focussed on the diesel Citaro range, with CNG an option. Talking to the company about hybrid, they see more opportunities to develop mild hybrid systems, to power electrically some auxiliaries traditionally driven from the engine, but there does not appear to be any appetite for full hybrid. All manufacturers spent a fortune developing Euro6 engines. Although most of the volume is fitted in trucks and that will continue, they also have to recoup investment by selling Euro6 buses. There are currently around two dozen of the latest generation of Mercedes-Benz fuel cell buses running in various countries. The reliability was at first let down by an AC/DC convertor, but that supplier has now developed a solution and the vehicles are performing very well. Daimler Buses benefits from sharing fuel cell technology with its colleagues in the car operations and is very pleasantly surprised by the durability of the latest generation of fuel cells. One of the challenges is that, in some places, hydrogen is available at a very low price, because it is a by-product of chemical processes. In other areas, it is extremely expensive. That is a supply problem that has to be resolved. Just to give you one ridiculous example, the town of Whistler in Western Canada stopped running fuel cell buses because the hydrogen was trucked right across Canada from Quebec! 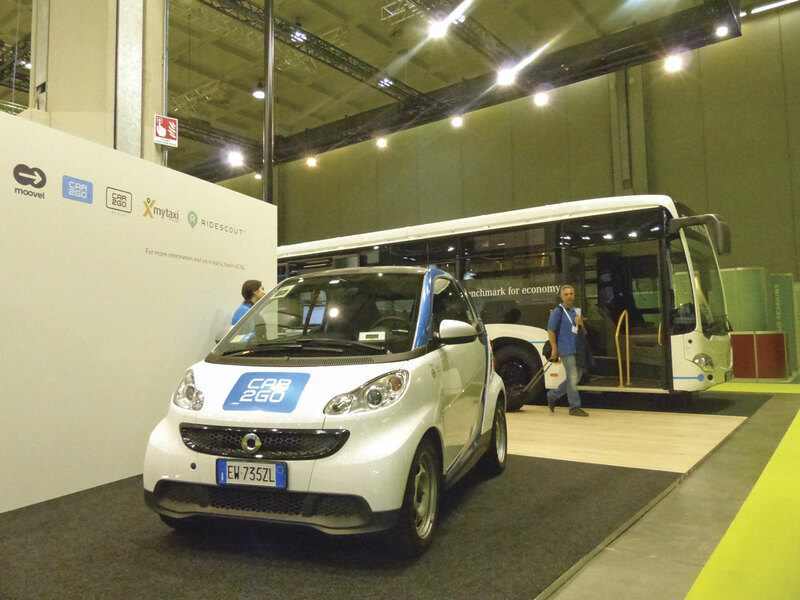 The CAR2GO project of Daimler’s Moovel subsidiary. One of the interesting subsidiaries of the Daimler Group is Moovel. This invests in all kinds of transport projects. The portfolio includes the CAR2GO scheme for car sharing in cities, using the compact Smart car. Moovel also has a 5% shareholding in Flixbus, the largest German intercity coach operator, to learn how that industry works. 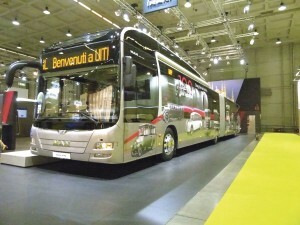 Next door to Mercedes-Benz, Iveco Bus displayed a 12m Urbanway bus, fuelled by CNG, for ATM, the city operator in Milan. This option has completed the Urbanway range that has already been launched in diesel, hybrid and articulated layouts. 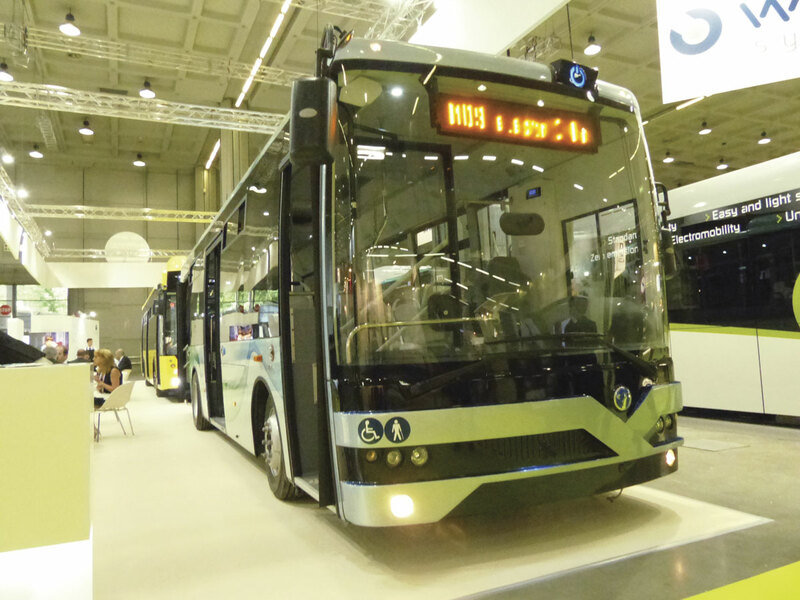 Sylvain Blaise, President of Iveco Bus, said that he expected half the city buses delivered by his company this year would be either CNG fuelled or hybrid. Gas is popular in France, partly because GAZ de France is willing to install the refuelling facilities and recover the cost over a number of years in the price of gas supplied. There is little advantage in terms of emissions, compared with Euro6 diesel, but gas buses are noticeably quieter. 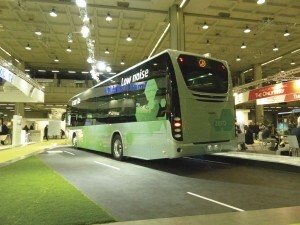 At Busworld Kortrijk in 2013, Iveco Bus launched the four axle low floor prototype all-electric Ellisup bus. This project is proceeding well and there will be further news when Paris hosts a major conference on the environment towards the end of the year. MAN’s Lion’s City with new frontal styling. It is branded for 100 years of MAN truck and bus. Next along the main aisle was MAN. 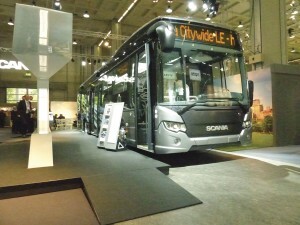 Their exhibit was an articulated Euro6 diesel Lion’s City but with the same frontal styling and hood over the front end that was first introduced on the Hybrid model. Presently, MAN city buses are framed in Starochowice in Poland and then trucked to Poznan for finishing. This inefficient arrangement will come to an end in 2017 when all production is concentrated in the former Star factory. 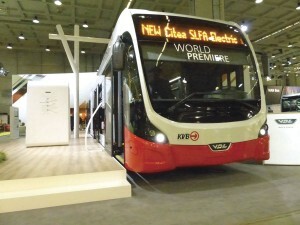 At that time, a new generation of city buses will be introduced. MAN and Iveco Bus appear to be the two European manufacturers most confident about CNG as an alternative fuel. It is somewhat ironic that, in recent times, one of the main gas markets for MAN has been Sweden, and particularly Stockholm, right on the doorstep of Scania. Ankara, where MAN has its main Turkish factory, has also bought large numbers of CNG buses from that plant. A high wall separated MAN from Scania whose exhibit was a Citywide low entry bus with a biogas fuelled engine. Making the point about the merits of biogas on the stand was a bucket of waste and a free-standing toilet which was, incidentally, immaculate compared with those in the exhibition hall. I had an interesting conversation with Klas Dahlberg, President of Scania Buses, and Anders Grundströmer, MD of Scania India. His company now has intercity coaches in volume production and recently launched a city bus based on the previous OmniCity. However, Scania has now taken the decision to put the current Citywide into volume production for the Indian market. The aluminium structure requires minimal tooling and will stand up well to the Indian climate. Anders said that the Indian market is becoming more demanding and that some of the better operators are starting to understand total life costs. Although the Scania vehicle is among the most expensive, it will have a much longer operating life. Currently, many Indian buses are rebodied after five or six years and are not as durable as the best Western European designs. He said that setting up manufacturing in India had been the most challenging job of his career, but the most enjoyable. In the twelve months to the end of March, the Indian market for buses and coaches over 12.0 tonnes gross was just under 50,000 units. This was one of the lowest levels in recent years but the new Government was starting to implement a number of infrastructure and stimulus programmes that would help the market to grow quite substantially. Bearing in mind that India has a population of around 1.2bn people and low levels of car ownership, the future for bus and coach transport must be bright. 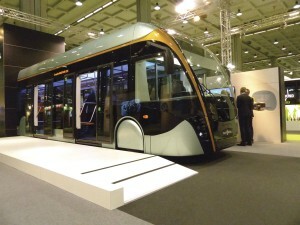 VDL displayed an all-electric articulated Citea bus, the first of eight that will enter service in Cologne. This had a re-designed front with a sloping tram-style screen and sub-structure. The vehicles will enter service on a 10km route, taking fast charges from overhead supply at each end of the journey. MD, Remi Henkemans, was happy with the way that markets were developing. The Citea LLE, previously known as the Ambassador, was selling well in a number of countries, especially in the Nordic region. Customers were realising that a 14.4 tonne gross vehicle was considerably more economical than an 18-19.0 tonne bus, but could carry the same number of passengers. VDL has won a significant order to supply 236 Citea LLE buses to BVG, Berlin, and will soon deliver the first Citea double deck prototype to BVG. It is being built in the Jonckheere factory and will have a number of special features to the customer’s requirements. BVG is already operating a prototype Scania double deck bus, so it will be interesting to see who eventually wins the competition for a bulk order replacing the oldest of Berlin’s current double deck fleet. 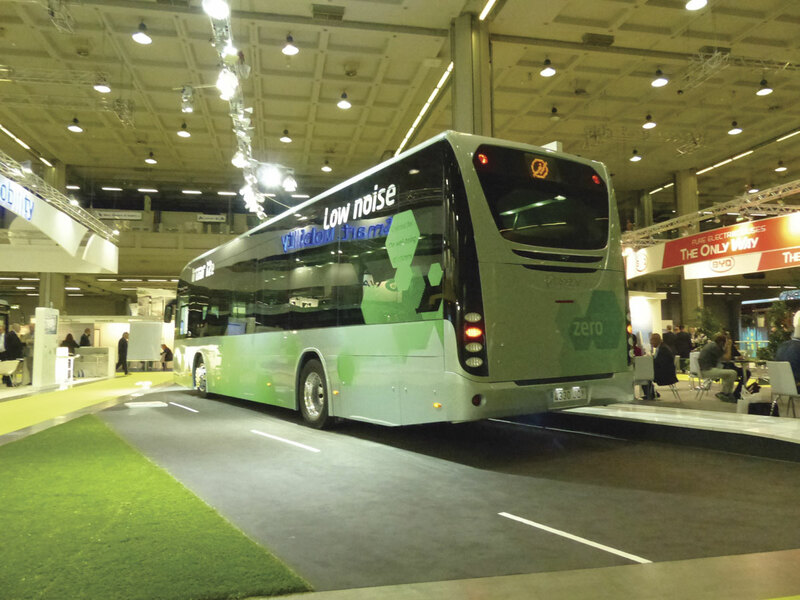 Volvo had a large and impressive stand with one of the three all-electric buses that will have started service in Gothenburg by the time you read this report. Stuart has already reported very widely on the Volvo hybrid, electric hybrid and all-electric programmes so there is no need for me to say more about the bus, other than that the standard of finish was excellent. Hakan Karlsson and Hakan Agnevall were present throughout the exhibition, with a strong supporting team of senior staff. There were excellent video displays showing the comparative costs and consumption of diesel buses and their various hybrid options. Volvo has taken a major step towards reducing the financial concerns of customers running all electric buses by renting batteries per mile and taking responsibility for recycling them. The two Hakans recognised the challenges that Volvo Buses faces in moving towards all-electric, but they have all the experience of their hybrid vehicles under their belt and they are substantially ahead of their main competitors. Moving on, Van Hool displayed a large part of the front section of their Exqui.City Bus Rapid Transit vehicle with a number of new interior design features. Jan Van Hool said that they were talking to a number of cities about Exqui.City projects. They took much longer to come to the contract stage than standard bus sales. We talked about the project to build lower cost coaches in Macedonia where labour costs are highly competitive. More than 600 coaches have already been built and shipped to the United States so the factory is fully up and running. The first EX models for European markets are now coming through, meeting demand from customers who want a Van Hool that is less highly specified than the premium range from Belgium. Output from Belgium is largely of high specification coaches. Van Hool has benefitted enormously from the growth of megabus.com, not only in the United Kingdom, but also in continental Europe and North America. They are not at liberty to discuss the size of megabus.com orders, because Stagecoach likes to wait until vehicles are practically ready before announcing expansion plans in countries like France, Germany and Italy. The shorter the notice that they give of new routes, the more difficult it is for potential competitors to react. Otokar is steadily increasing its presence in a number of European markets. They showed a full size Kent low floor bus, a new full low floor 10.6m model, and a high floor midicoach. All three vehicles were very well finished and also looked visually attractive. Dr Andreas Strecker joined the company as Chief Executive at the start of April. He has extensive previous experience in the bus industry, including nine years heading Daimler’s North American operations. After four years out of the industry, he said it was great to be back and he was very happy with what he had taken on at Solaris. The main factory at Bolechowo, near Poznan, is currently being expanded to provide additional production capacity and offices. Last year, Solaris built a record 1,380 units, but many of those were articulated and other special types, including trolleybuses and all-electric. In production terms, an articulated bus is probably around 1.7 times a standard bus, so the new factory capacity will probably be equivalent to 2,500 standard buses per annum. Solaris has delivered or taken orders for more than 40 all-electric buses. They have a surprising variety of specifications and equipment, including various sizes of batteries, inductive and conductive charging systems, solo and articulated designs. As all-electric buses develop out of their infancy, one of the challenges, for manufacturers and operators, will be to accept more standardisation so that operators find it as easy to maintain and recharge a fleet of electric buses as with diesel buses. Bozankaya showed its first full low floor articulated electric bus. This is a company with factories in Ankara, Turkey, and Salzgitter, Germany. In a most unusual arrangement, the structures are built in the MAN factory in Turkey, benefitting from that plant’s cataphoretic dip anti-corrosion treatment system. The structures are then taken by truck to Germany where all the electrical and other drive systems are installed. 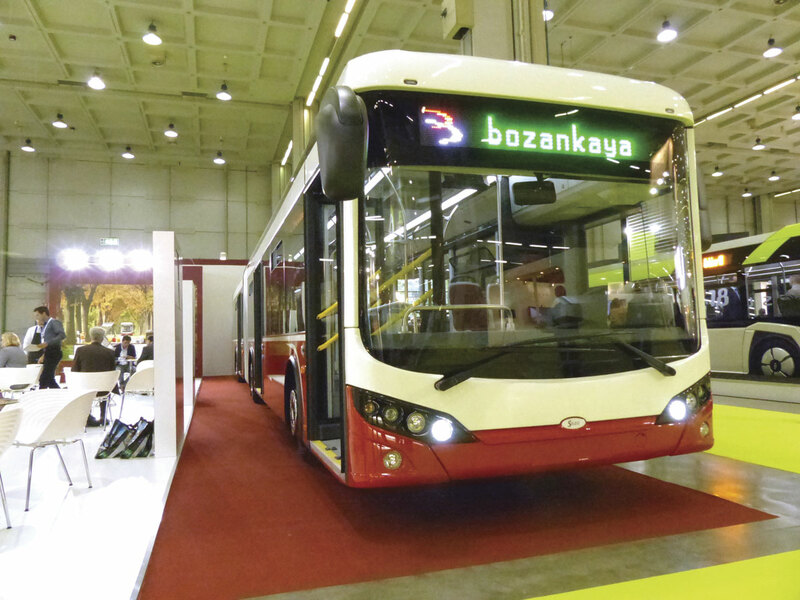 The vehicle on the stand had been completed only the week before UITP opened but Bozankaya said it had taken several orders for its standard 12 metre model. PVI, Power Vehicle Innovation, is a French company, previously known as Ponticelli Vehicules Industriels. They are best known for building a range of specialised commercial vehicles, including municipal trucks, but have built a number of small and mid size all-electric buses. 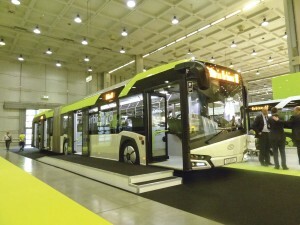 They showed an example of the Oréos 4X low entry midibus, using an Otokar structure. Several are now in service in France and the company has also converted a Heuliez 12m bus that operates at Nice Airport, using an overhead fast charging system. 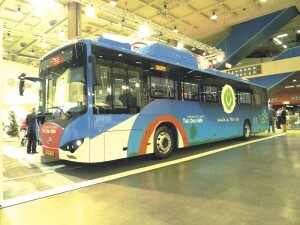 Temsa displayed a 12m Avenue low floor bus with a CNG engine and an all-electric MD9 low entry midibus, called the ElectriCITY. It was built to an overall length of 9.5m and had a gross weight of nearly 14tonnes. The Peak Permanent Magnet Motor had a nominal power of 100kW and a peak power of 200kW. Next up was the Irizar stand with an i2e all-electric bus. This vehicle was beautifully presented, as one might expect from a company better known for building luxury coaches. 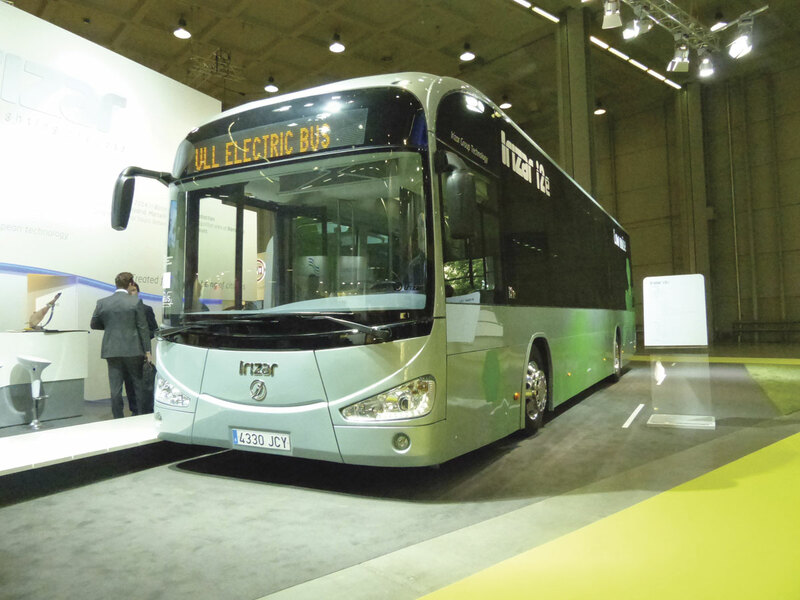 Irizar has involved a number of companies in the Group so that the electric drive system is in-house, although there is the option of Siemens. Their Datik subsidiary has produced excellent information systems so that operators can monitor their vehicles at all times. Gotzon Gomes, Export Sales Director, said that Irizar will build a new factory near San Sebastian to manufacture electric buses. Although the purchase price is higher than that of a standard diesel bus, Gotzon reckons that running costs will be lower, because electricity is less expensive than diesel. He was one of a number of manufacturers who said that electric motors are extremely reliable and need very little maintenance. Irizar is about to deliver two i2e all-electric buses to Go-Ahead for operation in London and will supply a further six to the French city of Marseilles. These are in addition to vehicles running in Barcelona, Madrid and San Sebastian. BYD had a 12m low floor all-electric bus on its stand. The batteries on this were around 30% smaller in size and weight than the previous generation, but still had the same 260km operating range. BYD argues that if the batteries are sufficient for a full day’s work, then a bus will not lose time being recharged at each end of a route. This can be important if it is held up in traffic. BYD is one of the world’s leading manufacturers of batteries. There is bound to be further development which will lead to further reductions in weight, without loss of range. BYD has said for some time that one of its future developments will be an all-electric double deck bus. Artist’s impressions have appeared at two or three previous exhibitions. The real vehicle will be launched at Busworld Kortrijk in October. Another Turkish manufacturer, Karsan, showed the Jest, a 6m minibus with much of the floor one step above the ground. It had the same FPT engine as the Iveco Daily, mounted at the front and driving through a six-speed synchromesh gearbox to the front axle. A fully automatic gearbox can be supplied as an option. Large numbers have entered service in Istanbul running on feeder services through narrow streets that are inaccessible to full size buses. The 8m Atak is a low entry midibus using an FPT engine mounted transversely at the rear. The same integral structure is used with a second intermediate floor for the Star midicoach, with good capacity for luggage between the floors. The Dutch manufacturer, Ebusco, had a stand displaying some of the key components of its all-electric bus. The company recently achieved 450km on a full charge on a delivery run from Munich to Berlin. Admittedly, the vehicle was running empty at a constant speed but it is further proof of how Chinese battery systems are developing. Cummins displayed both diesel and gas engines. Steve Nendick said that Cummins was working on a number of projects to obtain further savings in fuel economy. One of those was Stop and Go. People thought that the systems were perfectly simple because they were familiar with them in cars. However, there are many more challenges on a city bus than a car but he expected a significant announcement later in the year. Well done Transport for London. A leading German journalist told me he thought London was far ahead of German cities in payment systems. 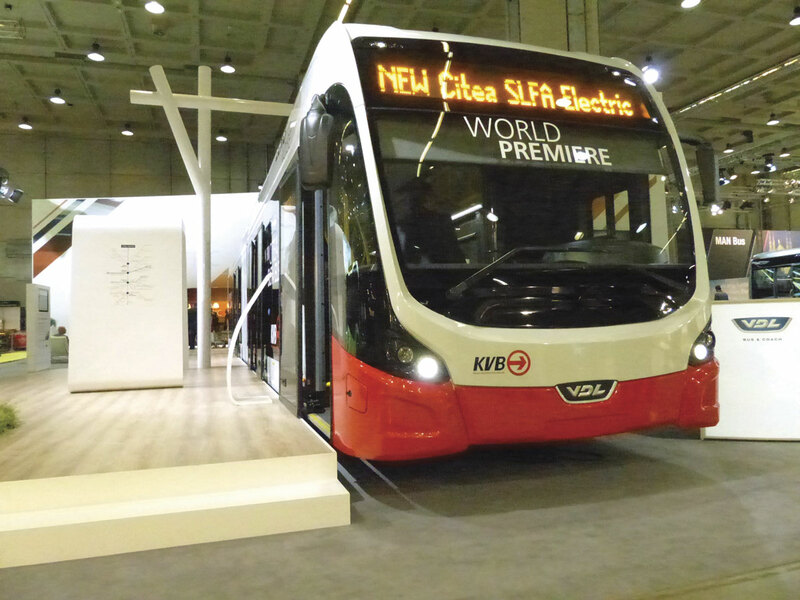 There was a good level of optimism among manufacturers and operators at UITP. According to ACEA, the European Automobile Constructors Association, registrations of buses and coaches above 3.5 tonnes gross were running 17% ahead of the previous year in the four months to the end of April. While some of that volume is of small vehicles, volumes are up in all the major markets with Spain starting to show quite strong signs of recovery from a very low level. The Italian Government is promising funding for new city buses, partly because of concern about the very old, noisy and polluting, buses still in circulation. Some operators shrugged their shoulders and said they had heard the same story several times before. On the other hand, Rome is talking about leasing up to 750 buses, enabling substantial fleet renewal. Looking at Western European markets, the introduction of hybrid buses has almost always required stimulus funding from national or regional governments. Hybrid systems have become more refined, with additional features like ‘arrive and go’. One of the benefits of hybrid buses is that they can share the same depot facilities as diesel buses, but with additional requirements on the maintenance side. The challenge for manufacturers with all-electric buses will be considerably greater because they need their own recharging infrastructure. However, RATP, Paris, laid down the gauntlet well and truly at UITP. RATP has set a target of having a 100% ecological fleet by 2025. That will require the replacement of around 4,200 buses, including hybrid and CNG fuelled, in the current fleet. It remains to be seen whether the funding will be available but other major cities will be watching those plans closely. It is a real incentive to the developers of electric buses.